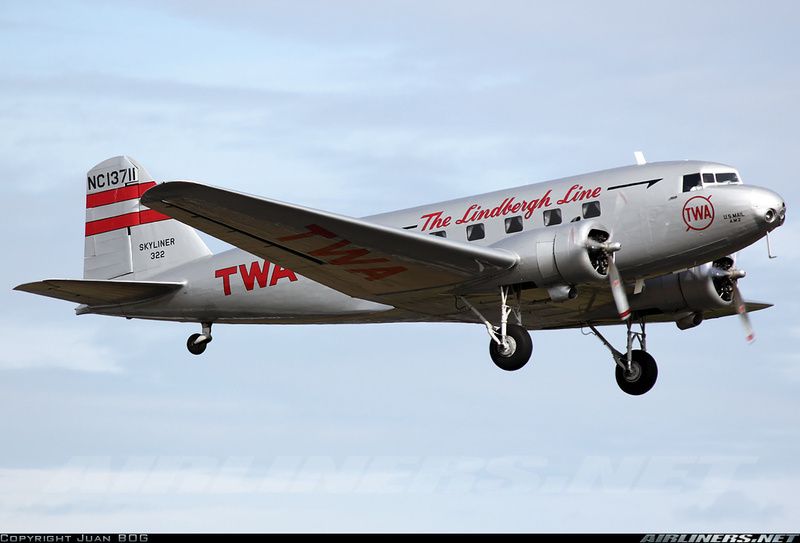 TWA created history when they attempted to buy Boeing 247s and ran afoul of Boeing's ties with United Air Transport. Turning to other manufacturers, TWA issued a specification for an all-metal trimotor airliner which could take off at any airport along TWA's routes with one engine out. Donald Douglas' young company, filled with some of the greatest aeronautical engineers of the day, met the specification with a twin-engined aircraft, something which nobody else had thought possible. The DC-1 was almost immediately a world-beater, and the design was put into service with TWA as the slightly longer DC-2 which was able to carry 14 passengers instead of the DC-1's 12. The incident which forever cemented the DC-2's reputation and made airlines around the world order it was the 1934 MacRobertson Air Race from England to Australia. The Dutch airline KLM entered DC-2 PH-AJU “Uiver” (race No. 44), but the airline flew it on its regular service route which was 1000 miles longer than the race route. The DC-2 stopped to pick up and drop off passengers and on one occasion it turned back to retrieve a stranded passenger. Toward the end of the race, the crew became lost in a storm and landed well off course in Albury, Australia. After the Albury townsfolk pulled it out of the mud it stuck in, It went on to finish the race first in handicap, and second overall behind a de Havilland Comet racing aircraft. It was also the first of the transport class aircraft to finish, beating out a Boeing 247. This kit is very nicely moulded in a light buff-coloured resin. It is more complex than a comparable Welsh Models kit, yet the wing join is superior. The model comes in a 4 segment heat-sealed plastic bag, keeping the smaller parts from being damaged by the larger ones. The instructions consist of one page with exploded views of the model, and very nice 4-view drawings of each decal option. The fuselage is two pieces of hollow resin from nose to tail, including the vertical fin. There is a little flash to clean up before the fuselage halves may be joined together. The windows are separate clear resin pieces, and the cockpit cab cover is also clear resin. There is no cabin interior, and I'm not certain how much of the beautiful cockpit detail will be visible through the fairly thick windows once the paint goes on. The clear parts will need a dip in Future to prevent fogging when they're glued into place. The cockpit part in my sample arrived a little warped from being confined inside the bag, but that may be sorted out by a quick dip in boiling water. The tailplanes are one piece resin mouldings. They will need to be drilled and pinned for strength. Given the construction, then cannot be left off until after painting and decalling. Since the kit schemes do not include a cheatline around the tailplanes, this should not be a concern. The engines and cowlings are moulded together. Very nice resin 3 blade propellers are provided. There is good detail in the engine fronts, which will benefit from careful painting. The landing gear struts and wheels are resin mouldings with surprisingly good detail. They will need only a good painting before they can be glued in place. The tail wheel is another nice little one piece moulding. The struts are moulded in a whiter resin, which is presumably harder than the standard resin the rest of the kit is made from. Time will tell whether they will deform under the weight of the model. I don't compare models to drawings or published measurements. When assembled it looks like a DC-2. The decal sheet has complete markings for Eastern Airways, American Airlines, PANAGRA and TWA. Kit No. 07 has markings for European users of the type: CSA, Lufthansa, KLM, Finnair and Swissair. The Lufthansa and Finnair examples were equipped with the broad chord fin, which is included in this boxing as an alternate to the standard fin, which must be removed and replaced. This kit is the one to get if you want a DC-2 in your collection. NC13711 restored and now on display at the Museum of Flight in Seattle. This aircraft has the broad chord vertical fin which was retrofitted to all DC-2s later on in their lives to correct an instability problem. PH-AJU “Uiver” Refuelling in Darwin during the last stages of the MacRobertson race. Note the original narrow fin chord. Highs: Beautiful resin mouldings. Simple construction. Verdict: Complete your DC collection with this kit.